With the last film that I reviewed, The Cabin in the Woods, there’s a very conscious effort to develop plot. It’s a total inversion when watching Whit Stillman’s delightful Damsels in Distress, an episodic film that is more interested in creating unique characters and dialogue instead of adhering to a confining narrative structure. Only having a passing knowledge of Stillman’s previous films, I was taken off guard by the writer/director’s clever sensibilities. His writing seems to operate under the principles of a bygone era, wherein verbal wit is a necessity in the face of overcoming narrative contrivances. 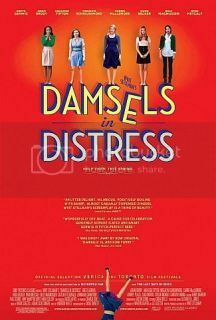 Damsels in Distress largely focuses on Violet (Greta Gerwig) and the exploits of her friends at Seven Oaks College. Leading a small group of daintily dressed women on righteous escapades of grand social delusions, the picture positions Violet and her friends as optimistic doufi (or doofuses). The exchanges held between Violet and her friends are incredible examples of verbal acrobatics, wherein dialogue tiptoes between elegance and broad satire. The film’s episodic structure lends itself to having dialogue exchanged between characters over long periods of time, only to bring the curtain down for the next act when we get our dash of narrative development. While the film certainly has lightness to it, there’s something particularly memorable about the individual characters in Damsels in Distress. If anything, it recalls something like Wes Anderson’s Rushmore, in that so many of its characters seem to be contained within the world in which they were written for. You can’t transpose any specific character or even a specific situation into any other film – they’re wholly contained in Stillman’s universe. It’s not even as if these characters come across as written characters either, they’re eccentricities have a natural aura that lends itself to the setting. It’s a bit hard to pinpoint what Stillman was going for with Damsels in Distress. It certainly functions as a throwback to a lost art of cinema. It’s also just a sharp display of character construction and dialogue writing. Stillman spans throughout a college setting and touches upon various touchstones of writing, wherein he provokes intellectual dialogue while developing jock characters in broad strokes. It’s quite an impressive feat. Perhaps its lightness works against it, but given its incredible charm and wit, it doesn’t really have to be. In the end, it’s really a picture meant to celebrate whatever makes you happy. You’ll find a kindred spirit in Violet if dancing the sambola is your thing.